macOS has a system-wide spell-check feature. Fortunately, for reader JGC, this feature can be adjusted by the user, especially when a problem like his occurs. Recently, the spell-check in Facebook is defaulting to French corrections. It first was funny, but it now is a serious consumption of time to constantly check for these auto-corrections. Any ideas how to remedy? Since the spell-check in macOS is system-wide, you should be seeing this in more than one application if it’s happening in Facebook via a web browser. There is a language setting for your Facebook account, but it doesn’t seem to interact with spell-check, which is a system function. Further, if you change your Facebook language, it changes its interface to use that language, which would be obvious to you. 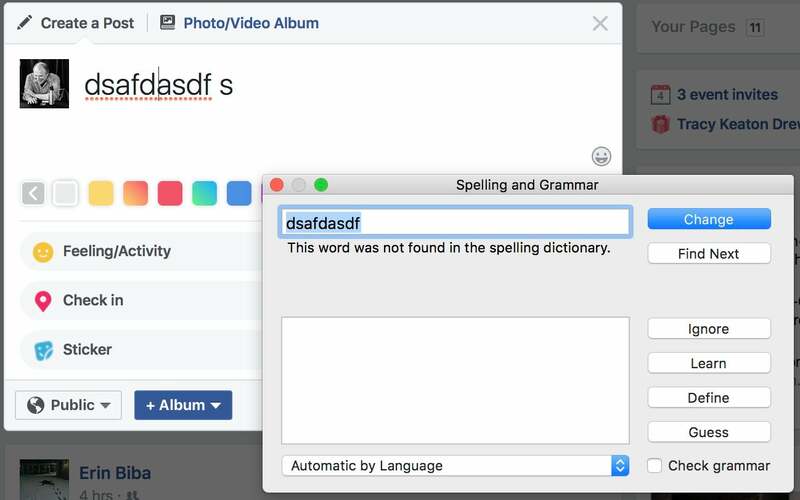 Check what language macOS thinks it should be checking your spelling in. In Safari or any app that lets you type, click in a field or a page to get a cursor and then select Edit > Spelling & Grammar > Show Spelling and Grammar. This floating palette may be set to Automatic by Language. Set it to U.S. English and see if that solves the problem. In the Language & Region system preference pane, English/English (U.S.) should appear at the top of Preferred Languages. Drag it to the top of the list if not. You can remove any other languages that you don’t speak or want to appear. Failing that, you can disable automatic spellchecking within Safari (or any app). In an app, choose Edit > Spelling & Grammar > Check Spelling While Typing and Correct Spelling Automatically one after the other to remove their checkmarks.